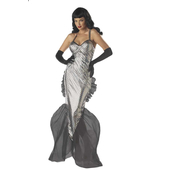 Sea Worthy Mermaid Costume includes a stretch gold foil and shell print shirred front gown with metallic fishnet ruffled hemline. 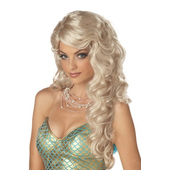 Costume also feature plastic collapsible trim inserted in hem creates mermaid fish tail shape. The neckline trim and headpiece are made from rhinestone encrusted jeweled trim. Also includes removable, adjustable shoulder straps. 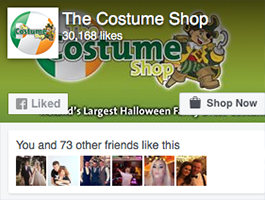 Looks Amazing on, very flattering.